Console of BRLESC-I computer, side view, from the archives of the ARL Technical Library. At the console: Lou Moeller. By the door: Horace Burkintere. Note the ENIAC photograph hanging on the side of the BRLESC. The BRLESC I (Ballistic Research Laboratories Electronic Scientific Computer) was a first-generation electronic computer built by BRL engineers at Aberdeen Proving Ground (USA) from some standard parts that were developed at the National Bureau of Standards (NBS, now NIST). 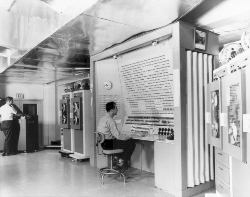 It was designed to take over the data-processing workload of the EDVAC and ORDVAC computers, which were themselves successors of the ENIAC computer. It began operation in 1962. The BRLESC was a general purpose, electronic, digital computer with parallel arithmetic mode and synchronous timing. It was designed primarily for the solution of scientific problems in which high computational speed and high precision were required. As the descriptive phrase "general purpose" implies, the machine could be programmed to perform any task which was amenable to numerical methods of solution. The binary number system was used exclusively in the arithmetic unit of the machine. The input-output routines (programs) automatically converted decimal input information into binary form and, conversely, converted binary numbers into decimal form for output. The arithmetic unit was constructed of standard vacuum tube logical packages, with tube driven, crystal diode logical gating. It contained 1,727 vacuum tubes of 4 types, 853 transistors of 3 types, 46,500 diodes of 2 types, and 1,600 pulse transformers of 1 type. Logical events were controlled by a five-phase megacycle clock, permitting decisions at the rate of five million per second. The storage system of the machine consisted of a high-speed magnetic core memory of 4,096 words. Each word was 72 bits long, which was equivalent computationally to approximately 19 decimal digits, since 4 parity bits and 4 sign bits were not included in the operands. The complete read-write cycle time of this memory was 1.5 microseconds. Magnetic drum storage units were installed as back-up memory. The capacity of these drums was about 35,000 words. The input-output devices of the machine were capable of reading cards, punching cards, reading magnetic tape, and recording on magnetic tape. A maximum of 16 magnetic tape handlers could be installed on line, that is, they were directly accessible to the programmer. Any two magnetic tape handlers, one drum, the card reader, and the card punch could be operated simultaneously under separate automatic controls. Arithmetic processing could occur concurrently with input-output operations. This meant that information was processed automatically as it became available from an input device and automatic interlocks were built into the machine to insure that the proper information was available. Information could be transferred to or from the machine by means of punched cards or magnetic tape. All information was coded in a binary manner since the machine could only handle 0's and 1's, that is, hole or no hole, or magnetization in one direction or the other. The binary number system was used because of the binary nature of most of the devices used in the construction of the machine. The internal workings of the machine were simpler due to only pure binary numbers and instructions being used. However, programmed routines could be designed to process any kind of information. The actual information could be a pure binary number, a binary coded decimal number, a binary coded alphabetic character, or literally any type of information the programmer desired. An output routine would arrange this information in the proper format for punched card output if desired, or for magnetic tape output. The punched cards could be tabulated on conventional punched card equipment and the magnetic tapes could be read by special converter equipment which operated into a high-speed printer at rates up to 1,500 lines per minute, with 160 characters per line. BRLESC was designed so that a maximum of concurrent operations could take place whenever possible. A "look-ahead of instructions, words, and indices" feature was incorporated to allow the machine to operate most effectively with a memory which cycles in one microsecond. Also, many special instructions could be executed while the arithmetic unit was working on an arithmetic instruction. In addition, all five input-output trunks could operate simultaneously. The control of BRLESC consisted of many units, each controlling their associated process, but all regulated by a master control center, which had a pre-determined time priority system and which prohibited the initiation of new events in any of the various concurrent trunks should there be some conflict in the use of information or units. For example, if two tape trunks were to use the same tape handler for different purposes at the same time, the trunk which received the first request got priority to use the handler and the other trunk had to wait until the first had finished using the handler. Also, should a program want to use information that had not yet arrived from one of five input-output trunks, the master control center recognized the problem and caused the program to wait until the information was delivered. The master control also recognized manual commands from a console and then relayed the commands to the respective sub-unit. Magnetic tape speeds operated at an effective rate of 120,000 six-bit characters per second. Search through magnetic tape in the forward or backward direction by large blocks of information was an incorporated feature. New programs could be located rapidly through the use of file markers. Drum transfer rates were 130,000 seventy-two-bit words per second. BRLESC was provided with a parity system to check word transfers as they passed through the memory and to or from tapes and drums. The master control unit was altered in the event a non-parity condition occurred. The computer was designed to operate on an internally stored program of detailed instructions. This feature was the single, most important reason for the tremendous growth of the computer industry, because it made computers truly flexible and easy to use. Since instructions were in numerical form, arithmetic operations could be performed on them, that is they could be manipulated in the arithmetic unit. In this way the program could modify its own instructions during the course of the computation in response to conditions that developed. This allowed the programmer to exercise his ingenuity and gave him latitude to do many things without writing a great many detailed instructions. Another very valuable feature was that the machine could change address in instructions by fixed amounts automatically. This feature was called indexing and permitted the programmer to use the same set of instructions to process as much data as he desired simply by changing the index value instead of modifying the basic instructions. Code checking features included stopping on any selected address, the display of the contents of any memory cell, the display of normal or abnormal conditions, the ability to manually store in any selected memory cell, and the ability to transfer control to any part of the system. Parity checking was performed in each of the four 17-bit groups in each word. It was believed that BRLESC would be a significant contribution to the Ordnance Corps and to the scientific community, because it would permit the solution of problems never before possible due to the excessive amount of time required; and it would solve these problems at a precision which was possible on earlier machines only by complicated, time-consuming methods.